DANGER: Workers remove asbestos, a toxic chemical that was formerly used to prevent fires, from the walls of the old school building April 29. Asbestos must be removed first to prevent poison dust from being released when the building is demolished. Shalhevet plans to relocate to the Westside Jewish Community Center for the 2014-2015 school year while its new building is under construction, school officials confirmed yesterday evening. Also, the start of school will be delayed one week, to Sept. 2, to make time to prepare the JCC, they revealed. Board president Larry Gill and Head of School Rabbi Ari Segal said they would give the news to the community via e-mail later today. They shared a draft of the e-mail with The Boiling Point. The JCC is located walking distance from Shalhevet, on Olympic Boulevard about two blocks to the east. It has been the site of Firehawk home games in basketball and volleyball, and also was the original location of the school when it opened in 1993. Shalhevet agreed last year to sell the south two-thirds of its property to Alliance Residential, which plans to build apartments and stores facing San Vicente, Fairfax and Orange Grove. The $14.2 sales price, which closed escrow April 17, will help pay for a new three-story school building on the remaining north end of the site, though officials are trying to raise $10 million so the school can be completely debt-free. Under the terms of the sale agreement with Alliance, Shalhevet could have leased back the southern part of the property for $1 while construction went on. Moving to the JCC instead will speed up construction by getting school out of the way, while also responding to parent concerns about holding school so close to construction, officials said. BACK TO THE FUTURE: The Westside Jewish Community Center was home to Shalhevet when it first opened in 1993. In particular, parents had expressed concerns about the disruption of classes from construction noise, the affect of the dust on the air quality, and safety issues from being next door to a construction site. As if to make the point, asbestos abatement started yesterday. Workers in white body suits examining the old building with machines to detect the presence of the deadly chemical, which is banned today but formerly was used to prevent fires. Because knocking down the building will create dust, all asbestos must be removed demolition can begin. “We are confident that the move to the JCC will benefit the students and the school,” said Mr. Gill in an email to the Boiling Point. He said the opening of school was being delayed because Shalhevet can’t start moving in until after JCC summer camp is finished. Unsolved problems remaining include a lack of parking and and faculty office space at the JCC. “There is really no parking onsite, and office space for the faculty is virtually nonexistent,” said Mr. Gill. Student reaction to the news was varied. Junior Josh Goldner also worried about the JCC’s other uses. “We’re just going to need to avoid the five-year-olds and the swimming pools,” said Josh in a Facebook posting after the decisions were announced. 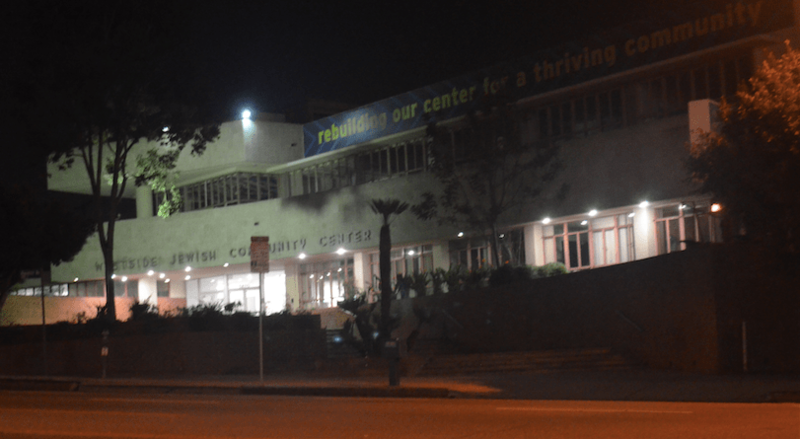 Among dozens of other comments on Facebook were some noting that Shalhevet was housed at the JCC during its first years, before acquiring the current site, a former hospital. “Verily, the apple fall not far from the tree whence it came,” wrote alumna Jenny Newman ’10. Junior Sigal Spitzer wrote just one word. Junior Rina Katzovitz may have summed up the situation for students who will graduate a year from now.